Bell & Ross deepened its involvement in high-speed adventures this year on two fronts. One part of the equation is the Paris-based watch brand’s co-sponsorship of the 2016 Renault RS16 Formula One car, a partnership announced earlier this year. Recently Bell & Ross expanded its racing profile with a breathtaking design for a sleek 610-horsepower concept car that looks like it’s about to liftoff from a space station and orbit the earth at dizzying speeds. The design, called AeroGT, was displayed at the Bell & Ross stand at Baselworld 2016. Here iW spoke with Bell & Ross Co-Founder, Carlos Rosillo about the brand's involvement with Renault and the new AeroGT. 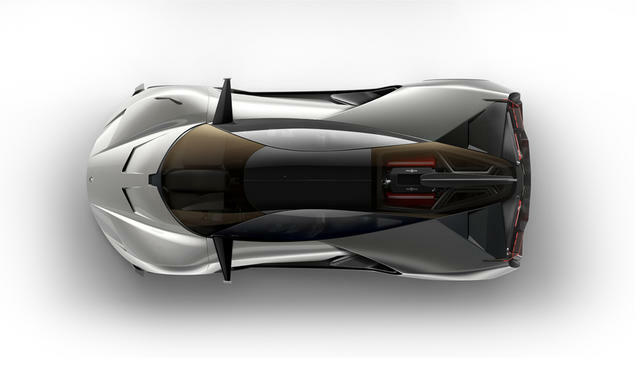 The concept is a 4.7 meter-long car with the angled edges and cutting overhangs that recall a stealth fighter plane. Designer Bruno Belamich, who doubles as Bell & Ross’s creative director, says he wanted to combine the aeronautic roots of his company’s watch designs with the excitement of legendary Italian GT ‘grand tourismo’ race cars from the 1950s and 1960s. In that era, he notes, GTs relied on a classic layout: front engine and rear-wheel drive. Later on, engines on the whole moved to the middle of the car, just behind the passengers. The Bell & Ross AeroGT adopts this approach, but then takes it to the skies. The car’s drop-shaped glass roof recalls jet cockpit covers. The car’s thin wing mirrors are inspired by the small wings placed on the nose of a fighter. The two exhaust pipes evoke turbojet engine exhausts, while the turbine-style rims imitate the vanes of supersonic aircraft engines. But, as many noted during Baselworld, it's the car’s rear aileron that most evokes the silhouette of a jet aircraft. Bell & Ross explain that a 4.2l V8 twin-turbo engine using the latest eight-speed automatic gearbox would propel this concept car. The AeroGT’s 610-horsepower would allow the carbon fiber car to reaches 100 km/h in less than three seconds, with top speed estimated at 315 km/h. For this reason, the Bell & Ross concept car notably features a pitot tube, installed at the top of its right wing. This type of probe, which can be found in aeronautics, measures very high speeds. Belamich explains he worked with car designers and also spent hours studying jets, fighters and bombers as he was working on the AeroGT concept. The design of the car took just over one year. 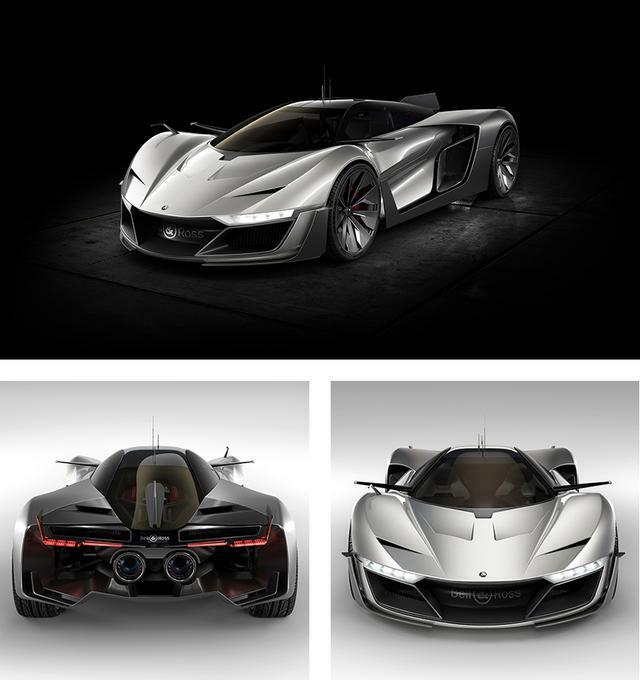 “It was very important for us to create a high-performance car with realistic characteristics,” he says. With the AeroGT’s fully realized, carefully conceived computer simulation available, it’s possible that a wealthy racecar enthusiast can now take the concept to reality. While the AeroGT concept car awaits its production date, Bell & Ross dedicates two very real new watches to the concept embodied in the AeroGT. Both are skeletonized models. One, the BR 03-94 AeroGT, is a chronograph and the other, the BR 03-92 AeroGT, is the three-hand version of the same design. 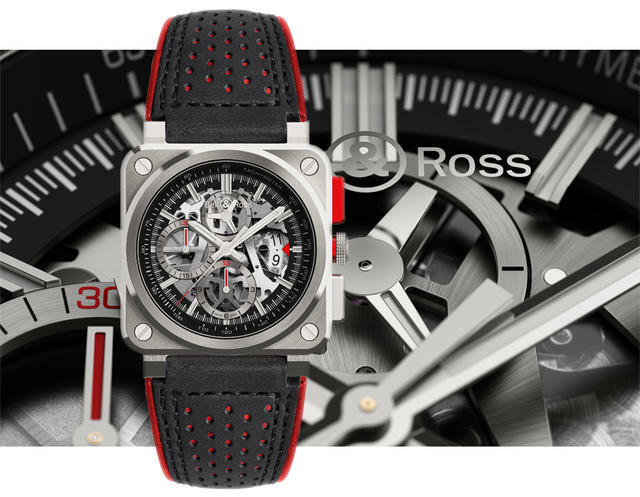 Each watch features a classic Bell & Ross cockpit-inspired square steel case with red aluminum crowns and, on the chronograph, red-accented chrono hands and pusher. The chronograph offers a tachymeter at its bezel-edge while the three-hand model displays a seconds track. The seconds hand of that three-hand model is red, as is the small fixed triangle indicating 12 o’clock–an ode to the dashboard counters of GT sports cars. These two new watches feature black quilted leather straps reminiscent of luxury car interiors. Their micro-perforations and red topstitching recall sport car seats. Both of these 42mm models are limited to 500 pieces. Prices: $8,800 for the BR 03-94 AeroGT and $5,500 for the BR 03-92 AeroGT. 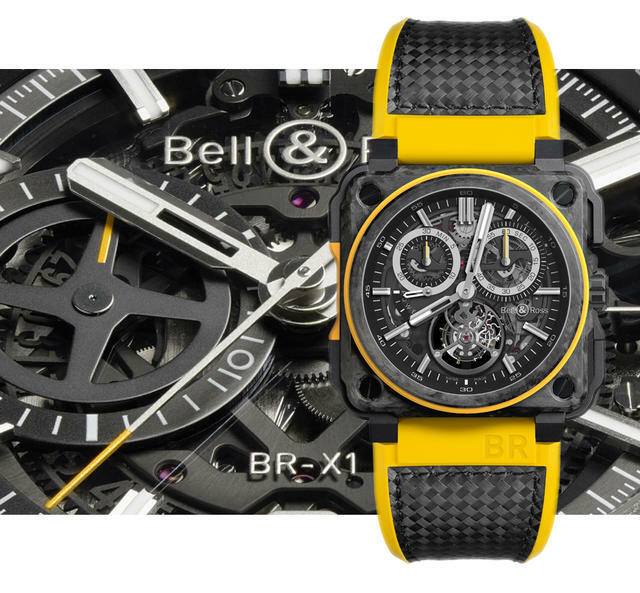 In addition, Bell & Ross recently introduced two more timepieces to celebrate their position as the Official Watch Partner of the Renault Sport Formula One Team. The BR-X1 RS16 and BR-X1 RS16 Tourbillon both feature a striking contrast of black and yellow, the same color scheme of Renault. Each includes a grey-tinted sapphire crystal and luminous metal indicators. The straps are woven rubber with a carbon fiber/rubber bi-material stitched in the center. A pure black rubber strap is also available. The BR-X1 RS16 is powered by a BR-CAL.313. The mechanism includes an X-shaped upper bridge, 56 jewels and a skeletonized chronograph. The timepiece is limited to just 250 pieces and is exclusively available at select locations. The BR-X1 RS16 Tourbillon contains a caliber BR-CAL.283. The hand-wound flying tourbillon contains a mono-pusher column wheel chronograph and is comprised of 282 parts. The BR-X1 RS16 Tourbillon is limited to just 20 pieces and like its sister model, the The BR-X1 RS16, it is available at select locations.